Deep Organizing v. Shallow Mobilizing… Be the Union! What looks good on a button would look better put into action. Editor’s Note: I originally had a version of this story was originally published in the Fall 2015 issue of The Portal, the PJSTA’s newsletter. Within union circles it is often popular to hear the union leaders encourage membership mobilization with the phrase “You are the union!” The idea, of course is that the general membership is the engine that drives the union, informing leadership of the directions it should be taking and that everyone plays a crucial role in their union. Theoretically there is certainly nothing wrong with this idea. It’s actually the way a union really should run. Unfortunately, to the leadership of our parent unions this often seems more like a gimmicky phrase than a guiding philosophy. 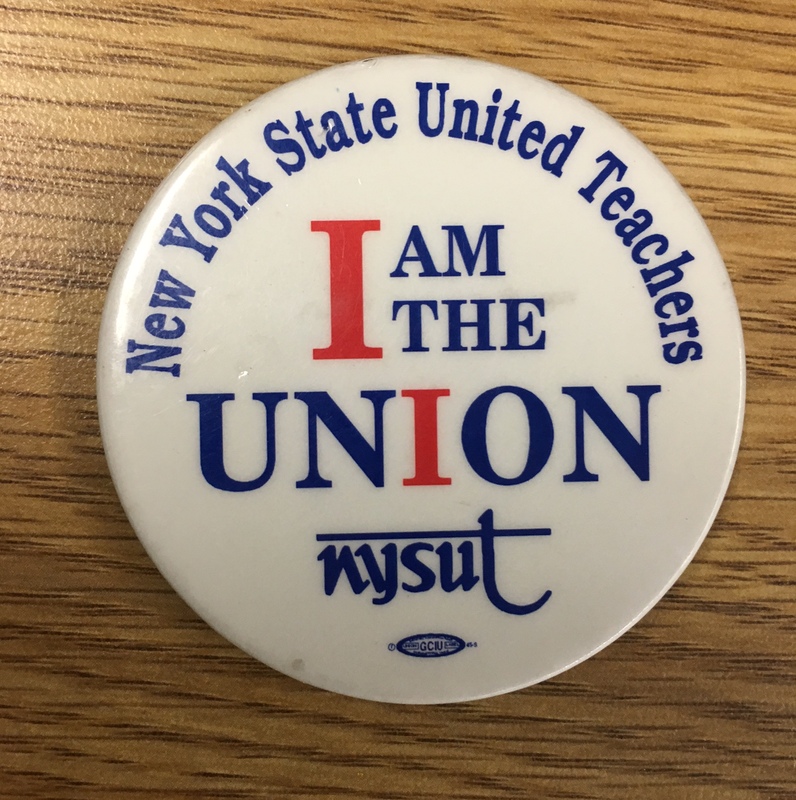 It looks good on a button but when it comes to how NYSUT, the AFT, and the NEA operate the philosophy is quite clearly one where the leadership send out top down mandates for the membership to carry out. At the crux of this issue is what should be the most important task of any union worth it’s salt, the task of organizing. Organizing should be one of the pillars of all union work. However what we more typically see are unions mobilizing around issues by simply directing membership towards carrying out a task, often one that is mindless in nature. Sending a fax or email by simply clicking a button for example. Or calling an elected representative and reading a scripted message. It requires almost no engagement from membership, simply a few moments out of their busy lives to carry out a directive. This is a strategy that has failed us greatly as we find the entire institution of public education in great peril. The issue of deep organizing vs. shallow mobilizing is one that unions at every level need to examine with a reflective eye towards how they operate. Kelley Collings, a member of the Philadelphia Federation of Teachers and an active member of the Caucus of Working Educators within the PFT, recently wrote an article on the Caucus of WE’s website titled, “What Deep Organizing Looks Like: The Real Work-to-Rule Campaign”. The article, which was a critique of the PFT’s fairly weak efforts to mobilize its members, had a great description about deep organizing vs. shallow mobilizing tucked into it. Let’s be clear on the difference between deep organizing and shallow mobilizing. Deep organizing makes us stronger as a union. Deep organizing demands that we have solid relationships with each other as PFT members. Deep organizing requires that we develop authentic power-sharing partnerships with parents and community members as we fight for the resources our students and school deserve. The Caucus of Working Educators is committed to deep organizing that leads to effective direct actions. Anything less than that does a disservice to our students and our schools. Collings suggestion boils down to a few key points. Union members should be developing trusting relationships with each other, with the parents of their students, and with their school communities to plan direct actions that aid in our fight for the schools our students deserve. The deep organizing mentioned here is hard, time consuming work. Often times the direct actions planned take weeks, if not months to organize and put into action. Most of all it requires leadership to trust their members and relent some of their much valued control over the activist work that it’s membership is doing. Having said all that, it is literally the only way that we will be saved from the path of destruction that public educators have been marched down for several years now. All of the phone calls, emails, and visits to state legislators have mostly fallen upon deaf ears. The enormous amounts of VOTE-COPE money that NYSUT has collected and doled out to elected officials has had little to any positive impact on teachers as politicians have taken the money with one hand and voted for harmful education reforms with the other. So the easy mobilizing solutions of clicking a button to send a fax, sending money to VOTE-COPE, or reading scripted messages have proven to be fruitless. So let’s talk about what deep organizing looks like at the local level. Deep organizing begins with the irreplaceable task of being informed on the issues that face our profession and impact our lives and the lives of our students every day. This is a vast ocean of information and certainly not one in which anybody can claim to know everything about. Some issues are as general as poverty and some as nuanced as democratic structures (or lack thereof) within our unions. While it is unrealistic to expect every teacher to run out and become highly informed on all of these issues at once, it is very realistic to expect that every teacher is willing to devote some time every day to becoming informed on some of these issues. This is, after all, our livelihood. There are several ways to become informed. One of the simplest ways is to pick a respected blog and begin checking it daily. Many good blogs are updated at least five times a week. The average one of these blog posts likely takes an adult less than five minutes to read. Read one over your first sips of coffee in the morning each day and your level of knowledge of the issues will expand greatly in no time. Another way of getting and staying informed is via Facebook and Twitter where you can follow a steady stream of information pertaining to the important issues. Use these mediums simply as a stream of information or jump in and become part of the discussion, using the social media to banter, debate, and question the issues with other participants. If you are a more traditional reader who enjoys reading books, there are a plethora of options out there. Reign of Error by Diane Ravitch, This is Not a Test by Jose Luis Vilson, and Strike for America by Micah Uetricht are just a few titles that deal with the issues that are prevalent in our profession. Read one on your own or create a book club with friends or colleagues. Finally, interact with your colleagues. Discuss these issues with teachers in the faculty rooms at lunch, happy hours after work, or in a walk out to the parking lot. Share opinions and ask questions. Help educate and inform each other on our mutual struggle. Being informed is the all important first step to take. In my experience, an informed teacher is naturally driven to begin the deep organizing that is required of us. You won’t need a list of talking points to interact with parents about the abusive reforms being foisted upon their children and you won’t need union leaders requesting you to “take action” as your professional conscience will be driving you in that direction already. Teachers are a smart, passionate, creative, and resourceful bunch. We have everything we need to combat the assaults on public education within our ranks. Decide how you will go about the task of deep organizing. Consider what actions you will take to become a part of the solution. You are the union.